Microsoft has released a preview for Intune connector for Active Directory that enables user-driven Hybrid Azure Active Directory join for Windows Autopilot. 0x80070658 - Error applying transforms. Verify that the specified transform paths are valid. An example of the error message is displayed at the bottom of this topic. After installing the Intune Connector, you can restore the keyboard layout to its previous settings. 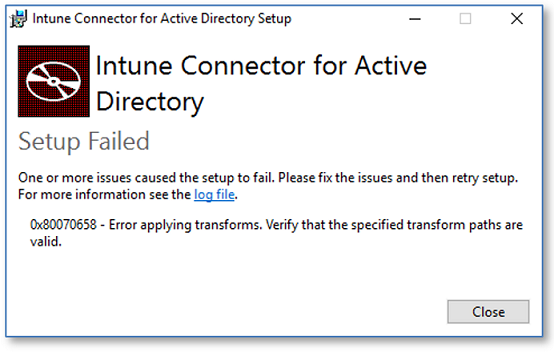 This solution is a workaround and will be fully resolved in a future release of the Intune Connector. Select one of the languages listed above and choose Set as default. If the language you need isn't listed, you can add additional languages by selecting Add a language.